Within the last decade or so, Charleston has exploded (not literally, thankfully). Not only has my lovely hometown been named the number one travel destination in the world by Conde Nast Traveler Magazine for four years running, the Holy City has also come into its own with new restaurants, multiple James Beard-award winning chefs, and cutting edge menus. If you're from elsewhere, figuring out where to eat while visiting might be a little intimidating. After all, Charleston has enough restaurants in the historic area that you could eat at a new one every day for nearly a year and a half. So, where do you start? That's where an experience like the Upper King Street Culinary Tour comes in handy. Instead of spending $50-100 on a meal just one restaurant that you may or may not love, you get to sample multiple dishes at several restaurants. 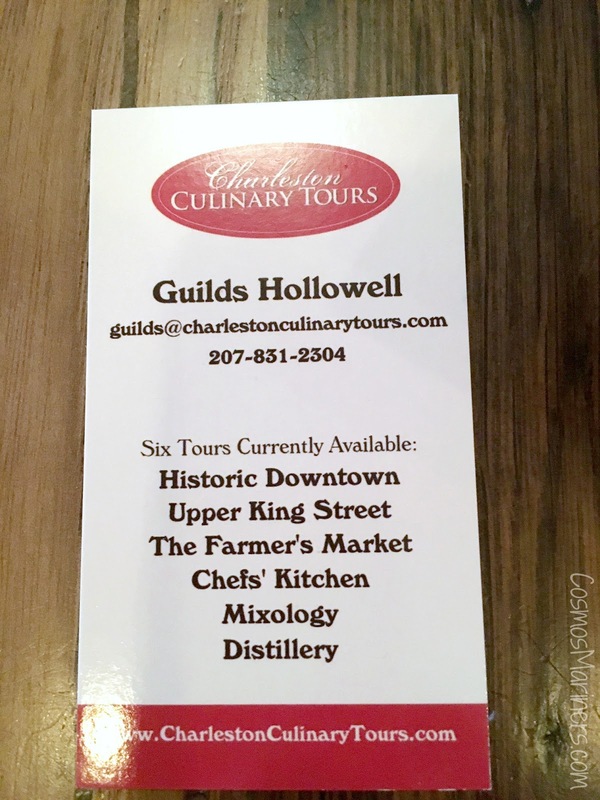 There are a few food tour groups operating these days in Charleston, but after taking several tours by Charleston Culinary Tours, I'm convinced that they are the perfect combination of history, education, and high quality food. 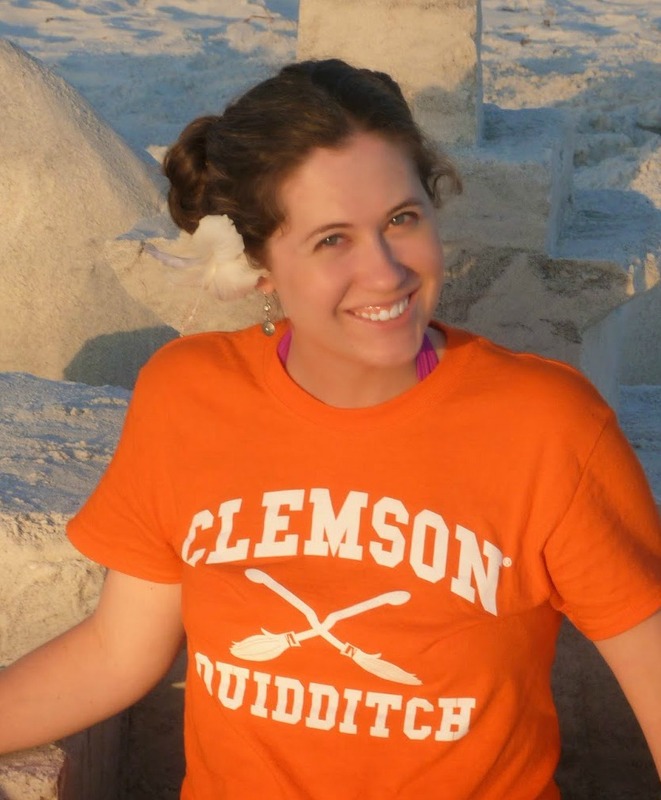 These tours are a must for any foodie visiting Charleston. Before we started chowing down, Guilds Hollowell, a fellow Mount Pleasant native and our knowledgeable tour guide for the afternoon, greeted each of the 28 guests for the tour at the door and let us know this was a talk with food and history. He then explained that the larger group would be broken into 2 groups of 14; each would have their own personal tour guide. Our tour would leave from HōM restaurant and proceed over to Rutledge Avenue, while the other tour would go south after their tasting at HōM. I really liked having a smaller group for this type of tour since it makes the experience seem more personal--and you don't have to jostle anyone while sampling the food. To bond us together a bit before setting out, Guilds had each member of our friendly group introduce themselves: our fellow foodies were from elsewhere inSouth Carolina, North Carolina, Ohio and Iowa. Guilds also shared a bit about himself: over 5,000 people have walked with him along the streets of Upper King in the past four years. When you consider that nine of Charleston's chefs have recently been nominated for the James Beard award, it's no wonder that the popularity of tours have exploded over our guide's tenure. In the hands of our capable guide, we dove into our first tasting session at HōM Restaurant (pronounced "Home") Restaurant at 563 King Street. HōM restaurant was named because the owners wanted their guests to feel as if they were dining out in their own houses. The owners are former chefs with extensive formal dining experience, but both felt they needed to provide the public with casual dining with food made with care and with locally sourced ingredients whenever available. The specialties here are creative burgers with fun sides. Our first offering was calamari with sundried tomatoes and goat cheese. The calamari was so tender and delicious. 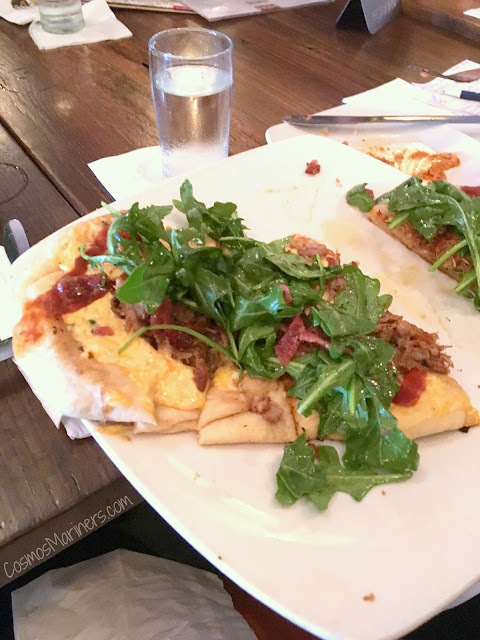 The second dish was Dixie Flatbread. This bread was topped with pimento cheese, pork confit, caramelized onions, maple bacon and arugula. Even though I'm a person who is not usually a fan of pimento cheese, I ate every bit of my serving--it was a unique dish that I would definitely order again! The final offering at HoM was a menu item called the “Green Gobble’n," a freshly ground turkey topped with braised kale, Swiss cheese, green goddess aioli and green apple. The tangy apple balanced out the creamy cheese for another tasty combination. And when you're finished with your meal, you can challenge your dining mates to a game of ping pong at the table in the back of the restaurant. Our group of 14 made our way down King Street, Cannon Street and on to Rutledge Avenue towards our second stop. On the way, Guilds offered many comments about architectural contrasts in the old and new that co-exist in the same area. The vibrancy and life of this area is returning after many, many years, and the streets are alive with people. 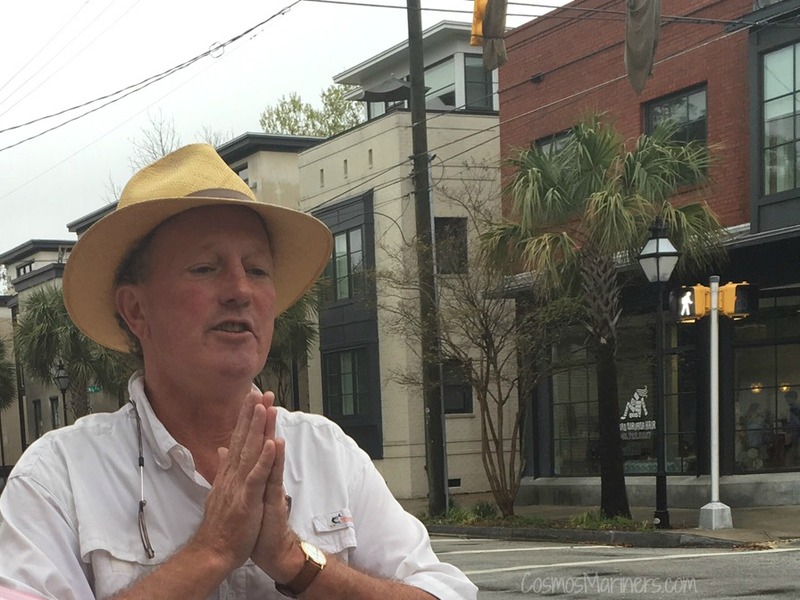 Guilds shares a bit of his knowledge about the revitalization of downtown Charleston. After our quick architectural interlude, Guilds guided us into R Kitchen at 212 Rutledge Street. Each morning, the chefs at this restaurant begin their menu selections by stopping by the Vegetable Bin downtown for fresh items for their dishes. By serving time that evening, they have prepared a five course dinner which is offered at $30 each. Dinner guests do not choose what they are served; instead the food is served at the bar in front of the chefs, so you will feel like you are in Mama’s kitchen eating dinner. 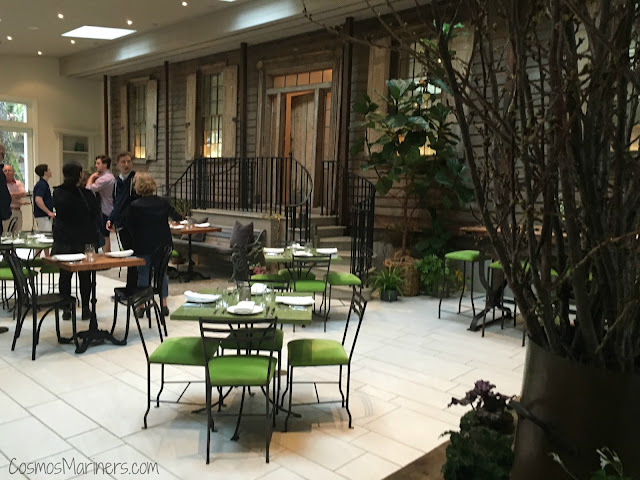 The architectural review board in downtown required that R Kitchen keep the original, historic facade, so the owners incorporated it into their decor! There are three seatings each night- 6 PM, 7:30 PM, and 9 PM with room for 15 each time. This restaurant does not advertise, has no outside sign, but still managed to have a three week waiting period for a reservation. Our tastings at this location consisted of Beef Wellington with mashed potatoes and a lamb lasagna. Both dishes were served on an eclectically decorated plate with a choice of wines (available at $5 per glass). 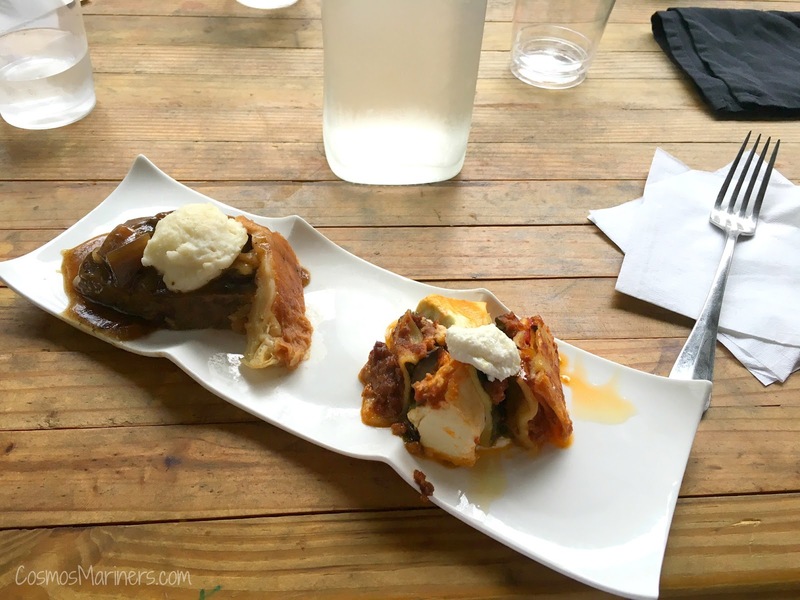 Of the two dishes at R Kitchen, I preferred the extremely tender Beef Wellington to the lasagna--I'm a huge fan of spicy foods, but the latter dish was too spicy even for my taste buds. The best (and worst) part of R Kitchen would be that every night is a completely different dining experience: you have no idea what to expect from the chefs, which is half of the fun! Our third stop was right next door to R Kitchen: Lana, a European-styled eatery, is located at 210 Rutledge Avenue. 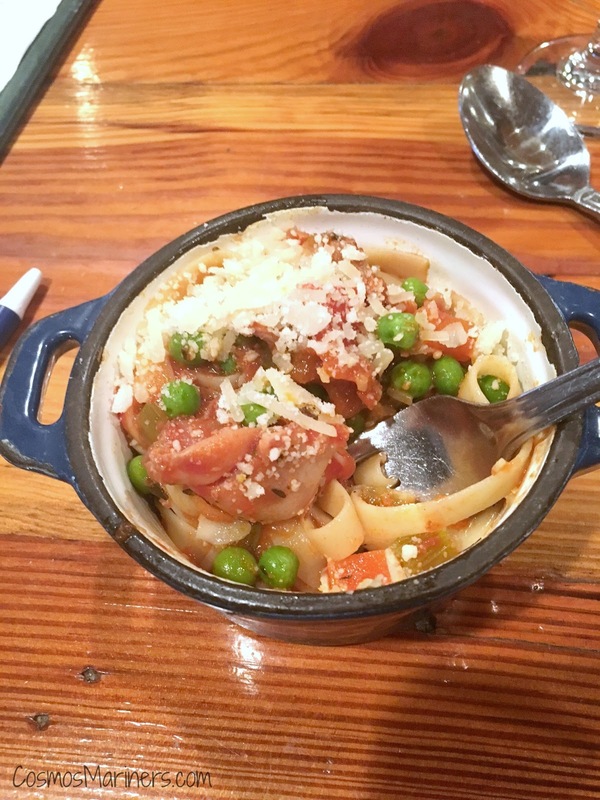 Using Mediterranean-inspired recipes, Chef John Ondo has made this restaurant a Holy City favorite: as a fellow Charlestonian, Ondo has tried to marry his love of Italian and Spanish food with the charm of the Lowcountry. The interior was tastefully decorated (and includes a wine rack that Ondo himself painstakingly stained and sealed), so you feel quite cozy in the space. At Lana, our group was presented with a squash carrot coconut curry soup followed by rabbit cacciatore. 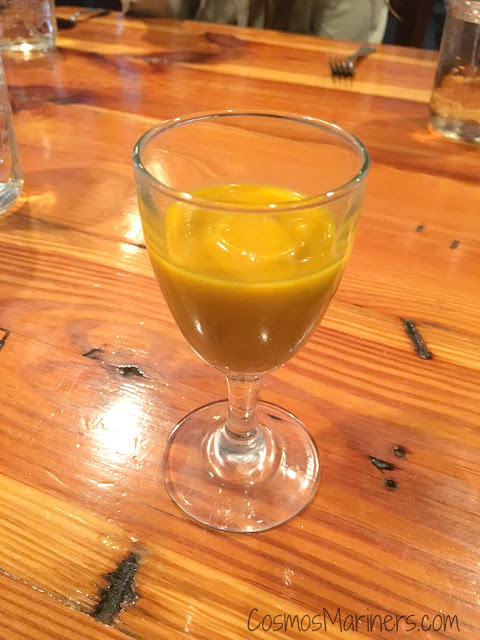 The curry soup was served cold (as it was supposed to be a light soup for the springtime!) and had a gorgeous orangey-red color. It was a bit on the spicy side, but, unlike the lamb lasagna at the previous restaurant, the spiciness in this dish complimented the flavors instead of overpowering them. The rabbit cacciatore came with a rich tomato sauce and linguini noodles. The noodles were a little hard to eat in the small bowls that we were given, but the struggle was worth the delicious flavors in this sample. Neither of these dishes are on the current menu at Lana, so if you want to try them, you'll have to hope that they make an appearance on the every changing Chef's Choice Tasting Menu. Last but certainly not least was a trip to our dessert spot: Jeni's Splendid Ice Creams. We were led by Guilds back to King Street where we visited Jeni’s Splendid Ice Creams which is the only recipient of the James Beard award for ice cream. We were all given samples of our favorite flavor followed by either a cone or cup of excellent ice cream: I chose the black and white cookie ice cream, while my mom went for the chocolate chocolate chip. 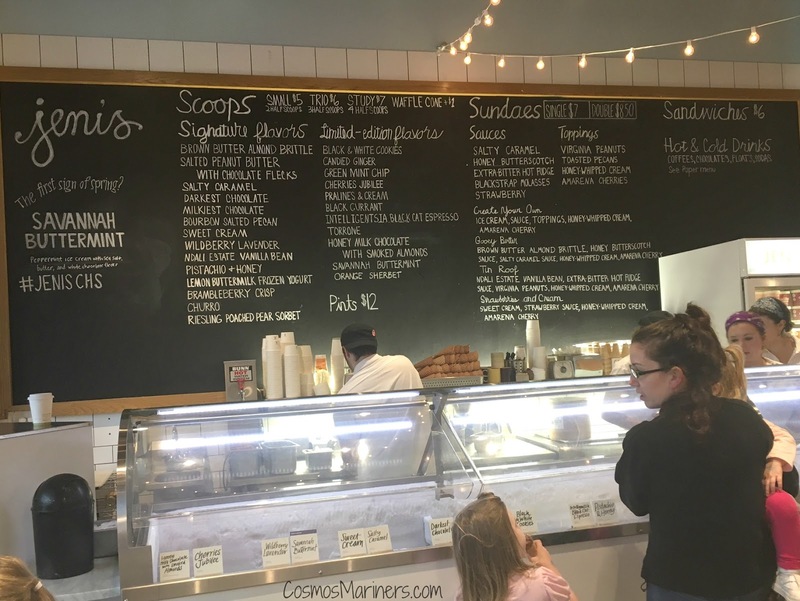 This isn't your usual ice cream shop: there are some super creative flavors that you're not going to find anywhere else like Wildberry Lavender, Churro, Brambleberry Crisp, and Brown Butter Almond Crisp. The owner is always introducing new flavors, so you never know what you're going to see on the menu. Normally, the ice creams are $5 for a scoop: it might seem like a lot, but the scoops are gigantic. We each were given a half scoop, which was nearly too much to eat alone. You could easily split the regular scoop for an inexpensive dessert idea. It was such a perfect end to a grand culinary delight of an afternoon! Tours are held rain or shine, so come prepared if the weather is threatening. You'll be stuffed by the end of the tour! Do not attempt to eat beforehand or you'll be missing out on some tasty morsels. 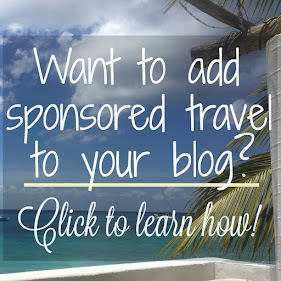 You'll get more than just a tiny sample at each place--the tour website does not lie when it promises that a tour can easily make a meal for most. Wear comfy shoes. Downtown isn't the most forgiving of places for high heels (I've gotten my fair share of heels stuck in grates and in cracks in the sidewalks), so trade in the fancy shoes for something that will go the distance. You cover a decent distance on the tour, and your feet will thank you at the end. There was a complimentary recipe book available for each guest. 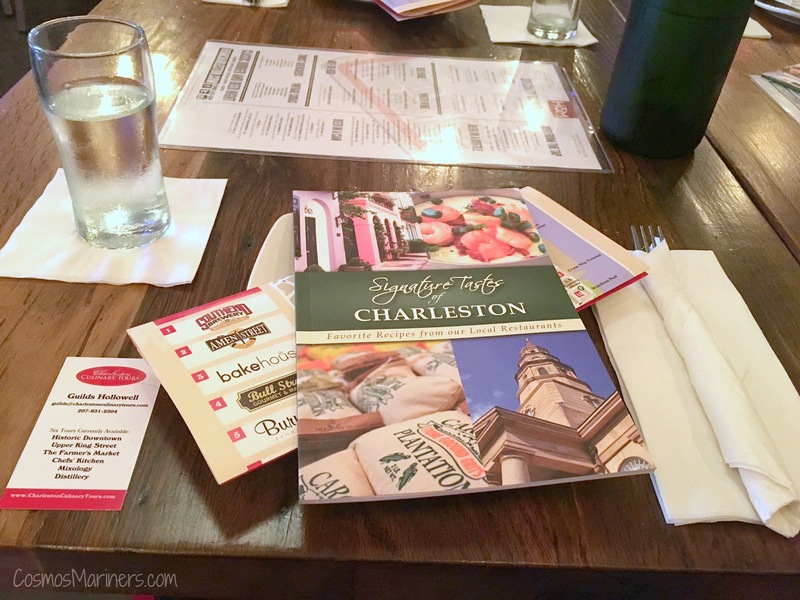 The paperback Signature Taste of Charleston by author, Steven W. Siler, is an awesome souvenir and has many of the recipes that we tasted on our tour in it. Be on the lookout for my versions of a few of these in upcoming posts of the Tasty Travels series! 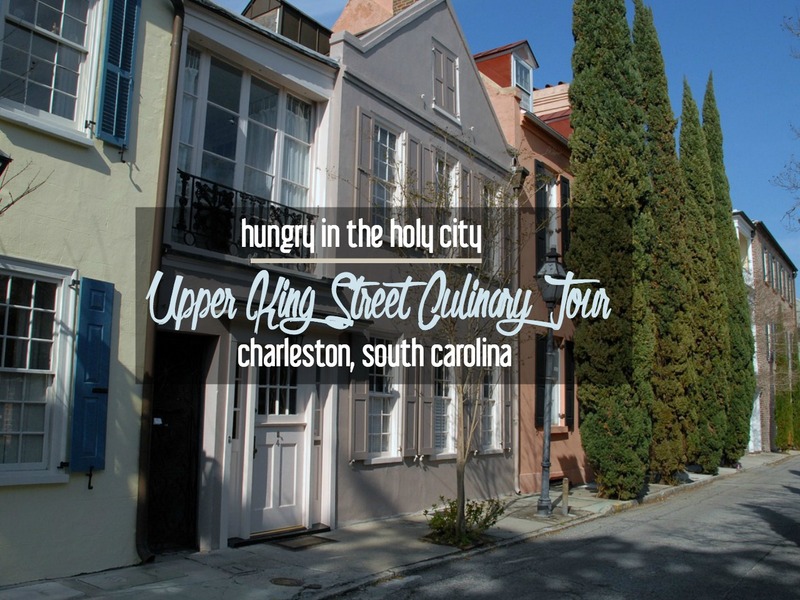 Would you be interested in going on the Upper King Street Culinary Tour? 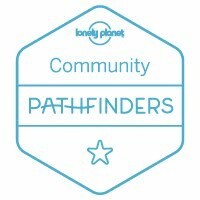 What's the best food tour that you've taken? 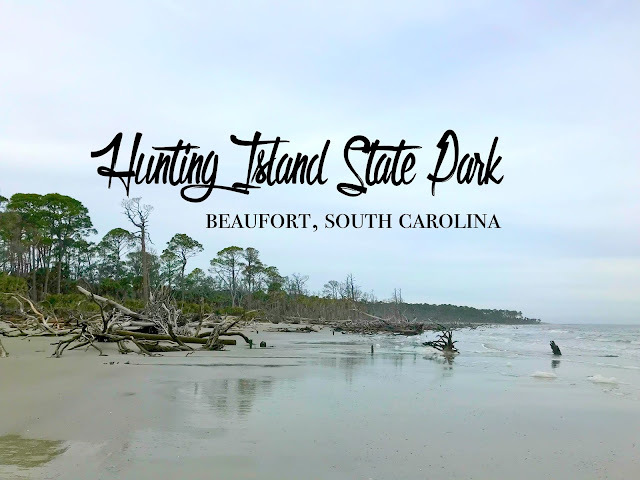 Learn more about what to do and see in the city with my first timer's guide to Charleston, and get some suggestions from across the Charleston area in my 101 Things to Do in Charleston post. I received a complimentary tour for two from Charleston Culinary Tours in exchange for an honest review. As always, all opinions are my own.